2 How to brew tea Puer? About Puer tea in China is legendary. He is considered one of the national treasures, and some of its special varieties generally forbidden to export from the DPRK. Puer tea so named by name Puer county, Yunnan Province of China, where it was traditionally produced, and which were brought for sale in the local market all the tea, made in this province. Pu-erh one of the most ancient varieties of tea, which is produced for centuries on complex technology, some points which are still kept secret. The essence of technology was that, that the tea leaves soaked in infusions, fermented by special microorganisms, surviving several years in storage, then compressed to form troches of various forms of. this tea, like a good cognac, matures, acquires a special taste and useful properties over time. It can store up to 30 years old, and its price is only growing every year. There are two kinds of tea: Sheng pu-erh and Shu Puer. Their differences are due to cooking techniques. To distinguish them is not difficult, even in appearance. Shen Puэr is light, greenish-brown leaves, in Puer noise leaves dark brown, almost black. Also vary tea and infusions: in Shen He translucent, light coloured, and at Shu - dark, neprozrachnыy. 2. Shu Puer produced by accelerated fermentation. Harvested tea leaves are piled in a big heap and poured some of the water, then covering with a cloth. So they will lie and a half to three months, after the leaves will dry and Xpress, or leave in loose form for sale. Shu harder to taste, there are no sweets, but it is softer, "chocolate". How to brew tea Puer? The healing properties of tea Puer great. The Chinese count up 22 therapeutic effects of this tea, believing it literally panacea. scientists, investigating its properties, came to the conclusion, that he really does clear the mind, cheer, some even causing the effect of extraordinary tidal forces and euphoria, similar to the feeling of intoxication. Tea also contributes to weight loss, improves digestion, lowers blood pressure, strengthens teeth and bones, cure heart disease, detoxifies. To benefit, you need to learn how to brew the tea. For welding need to select the correct utensils. It is best suitable glass or porcelain, which should be small in volume, because tea drink made quickly and do not leave for a long time. Pottery is not suitable, it will be unnecessary odors. Do not wash the dishes for washing, after washing it well dry. Glassware allows you to watch the game of tea leaves and the color of the drink. According to Chinese tradition, the soft water should be taken, from wells or rainwater. Anyway, Strain before using it. To boiling water for brewing is not adjusted, it should be about 80-90 aboutWITH. A glass of water taken pinch loose piece or in 2-3 cm from the tile pressed. Boil water, when the first bubble, turn off the kettle. Wait a minute, then pour the water into the dishes, where is the tea, drain water directly, This washing removes dust or strait, and the smell of damp earth, typical Puer. 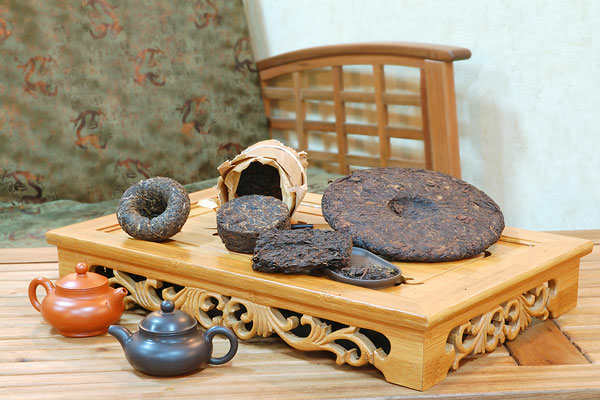 Experts advise to wash Puer so a couple of times. Then, pour the tea with hot water again, cover,. If the tea Sheng Puer is used for the first time, then half a minute, minute it's ready, longer brewing will contribute astringency, and when the tea stand for a long time, it will taste bitter and lose its useful qualities. Shu Puer can brew a little longer. 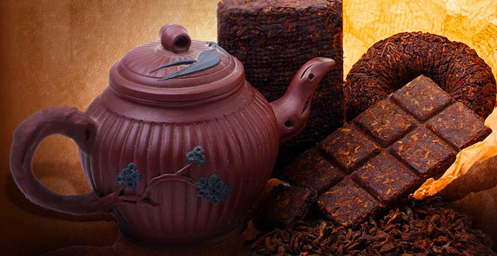 Total Puer can brew up to seven times, and quality to 15 time. With each new brew more tea flavor is revealed. The drink is poured into small cups, a large number of drinking tea may harm. Puer tea Shen also not recommended to drink on an empty stomach. 2. Puer tea can also cook. Initially, the tea should also be rinsed with boiling water. Brewed teapot with water, put on fire, when it starts to boil, and below will small bubbles, then spoon it is necessary to create a funnel in the water, which pour washed before tea Puer. reduce fire, to stop bubbling and wait, while on the surface appears brown foam and bubbles. Turn off the heat and cover the teapot lid, stand for a while, and tea ready. If you are using a glass teapot for tea leaves, can be observed, how beautiful open and fall to the bottom swelling tea leaves. you can add in a strong tea milk, which would give it an unusual taste and texture. Some add more and cocoa butter, especially useful this drink during flu epidemics. Everyone can pick out the way tea leaves, which would have appealed to him, and will assess the taste and splendor of the legendary healing properties pu-erh.